After servicing or replacing faulty parts, perform Clear Memory Mode Clear Memory Mode > OPERATION, and Inspection Mode Inspection Mode > PROCEDURE. For detailed operation procedures, refer to the general scan tool operation manual. Even if DTC is detected, the circuit has returned to a normal condition at this time. Reproduce the failure, and then perform the diagnosis again. Clear the memory using the Subaru Select Monitor or general scan tool. 2.CHECK BETWEEN ECM CONNECTOR AND BATTERY SENSOR CONNECTOR, AND BETWEEN ECM CONNECTOR AND ACTIVE GRILLE SHUTTER CONNECTOR. 1) Turn the ignition switch to OFF. 2) Disconnect the connectors from ECM, battery sensor and active grille shutter. 3) Measure the resistance of terminals between ECM connector and battery sensor connector, as well as ECM connector and active grille shutter connector. Repair the harness and connector. 3.CHECK WIRING HARNESS BETWEEN ECM CONNECTOR AND BATTERY SENSOR CONNECTOR, AND BETWEEN ECM CONNECTOR AND ACTIVE GRILLE SHUTTER CONNECTOR. Measure the resistance between ECM connector and chassis ground. 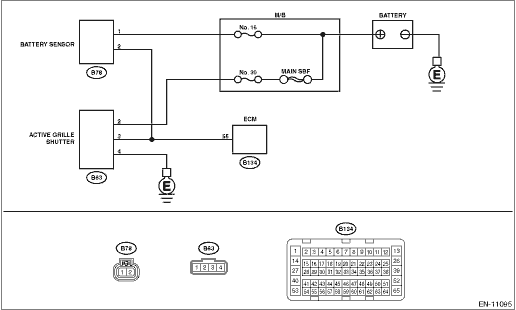 Repair the short circuit to ground in harness between ECM connector and battery sensor connector, as well as ECM connector and active grille shutter connector. 4.CHECK WIRING HARNESS BETWEEN ECM CONNECTOR AND BATTERY SENSOR CONNECTOR, AND BETWEEN ECM CONNECTOR AND ACTIVE GRILLE SHUTTER CONNECTOR. 1) Turn the ignition switch to ON. 2) Measure the voltage between ECM connector and chassis ground. 2) Connect the battery sensor connector and ECM connector. Even if DTC is detected, the circuit has returned to a normal condition at this time. Reproduce the failure, and then perform the diagnosis again. In this case, temporary poor contact of connector, temporary open or short circuit of harness may be the cause. Clear the memory using the Subaru Select Monitor or general scan tool. Detect malfunction of LIN communication. Judge as NG when the data sent/received via LIN communication is abnormal. LIN communication is used to send/receive data between ECM, battery sensor and active grille shutter. Always perform the diagnosis continuously. If the duration of time while the following conditions are met is longer than the time indicated, judge as NG. Malfunction Indicator Light Illumination: Illuminates as soon as a malfunction occurs. Dtc u0284 lost communication with active grille shutter module "a"